During the week ending April 23, the number of births registered in the metropolitan districts was 1580: of these 812 were boys, and 768 were girls. The average number in the eight corresponding weeks of the eight preceding years was 1476. 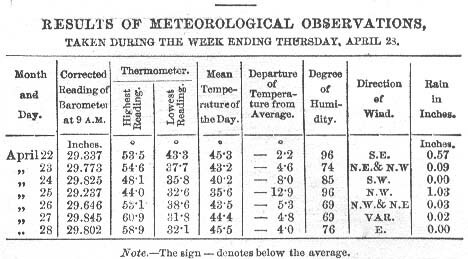 The number of deaths was 1182; in the week ending April 9, the number was 1340; and in that ending April 16, it was 1243: so that the mortality, up to Saturday lest, was decreasing by slow degrees; but it is to be feared that the severity of the weather, as shown in our table above, wi1l cause an increase of deaths. The average number of deaths in the corresponding weeks of the ten preceding years, increased in proportion to the increase of population, was 1038; consequently, the deaths registered last week are in excess of the estimated amount by 144. The number of deaths caused by zymotic diseases was 218 (their average is 185): of these, measles carried off 24; hooping-cough, 66; and typhus, 47. To dropsy, cancer, &c., 50 (their average is 47). To tubercular diseases, 211 (their average in 195): of these, 139 are due to consumption. To diseases of the brain, spinal marrow, &c., 137 (their average is 117): of these, there were 25 apoplexy, 25 paralysis, 51 convulsions. To diseases of the heart and blood-vessels, 54 (their average is 34): of these, 48 were diseases of the heart. To diseases of the lungs, 242 (their average is 148): of these, are due 126 to bronchitis, and 80 to pneumonia. To diseases of the stomach, liver, &c., 74 (their average is 58); and to violence, &c., 22. By comparing the number of deaths due to the respiratory organs, the decline of these diseases is shown; the number in the preceding four weeks were 420, 323, 251, and 242; from bronchitis, 231, 186, 128, and 126: but it will be seen that diseases of this class are still much more fatal than is usual in the middle of April; for the deaths from this class, as above stated, were 242; while the average in ten corresponding weeks in ten preceding years increased, is only 163.